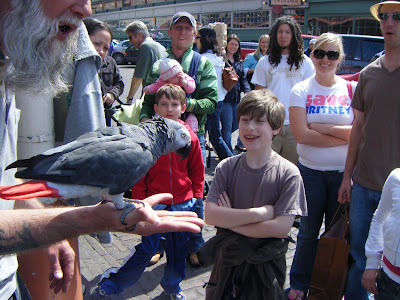 This weekend, you might want to take the kids along and check out the Pike Place Market Street Festival. And with summer fast approaching, chances are you may find yourself tooling around our festive Market toting visitors from out of town, who may be far more interested in the sights, sound and noshes than the glorious produce from the farm stalls. Seeing as some of those visitors may be of the pipsqueak variety, you may need a few pointers from someone who resembles that statement. And I’ve got just the “someone” who can help. When my boy was a wee lad, he’d beg me to go to the Market and bring bird seed from home, and the first thing we’d have to do is stop and feed the pigeons in Steinbrueck Park — despite the sign that tells us we’re not supposed to. Now that he can read and has a healthy respect for the law (“Mom! You’re speeding!”), we skip the bird feeding and go directly to the Nate feeding. No matter how many times we watch the salmon-tossing fishmongers pull a fast one, “magically” making that dead fish move and scaring the yell out of the tourists, it still cracks us up. And if you think that fish looks scary, you obviously haven’t seen that Stephen King-worthy guy who dresses like a clown and blows up balloons for a “donation.” I know more than a few kids who have donated a month’s worth of sleep, having awakened from sweaty nightmares just from standing there looking at that dude while watching him turn a balloon into a sword or a goofy hat. Ask Nate. He was also doing a scene straight out of “The Good, the Bad and the Ugly”. . .
With Nate playing Clint Eastwood’s part, and the bird dropping dead on cue. Hilarious! 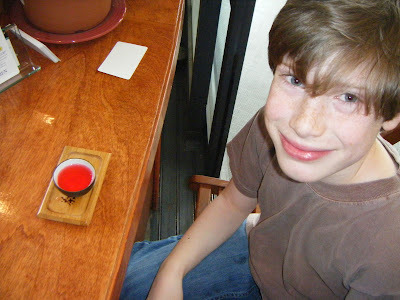 Most kids would be truly disappointed if you failed to take them to The Great Wind-Up, where they might test drive the toys and you can buy self-propelled plastic nigiri sushi. Or the Market Magic & Novelty Shop. Or Sweetie’s Candy. 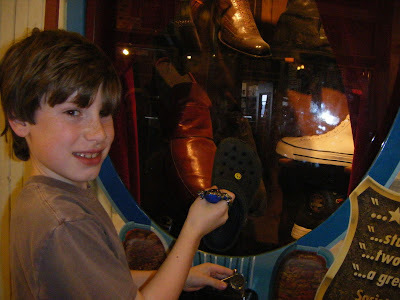 And, if they’re somewhat older and into such things, to Market Coins and Collectibles. 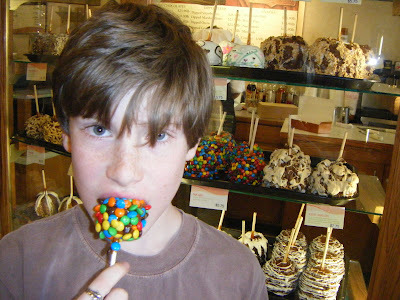 Before you call me to say, “I can’t believe your kid’s so spoiled!” And “How can you possibly let him eat all those?” Allow me to say a) You’re right! And b) I have the only kid I know who literally cried when, due to a medical condition, he was told he had to lay off the broccoli for a month. 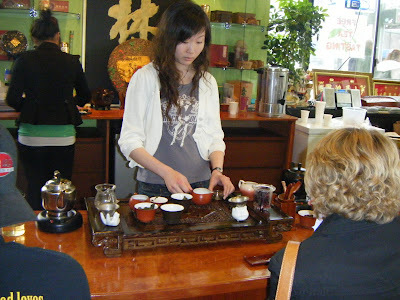 And this complimentary Chinese tea-tasting at VItal T-Leaf in the South Arcade . . . 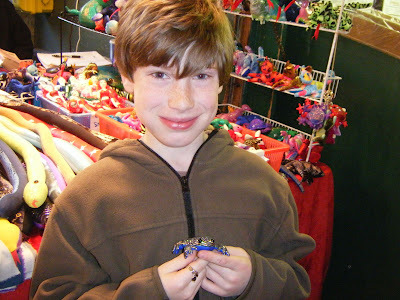 So tell us, what’s on your kid’s personal Market tour? Which places and what foods are on their must-go or must-have list? you’ve hit all of our favorite spots! 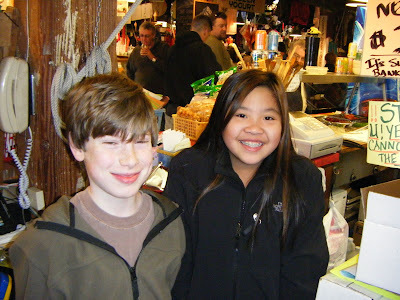 While my kids are little more jaded (read: teenagers) they and their cousins still really do enjoy the sights at the Market. I’m a former restaurant owner, been following your writing for a very long time, and I really enjoy this blog! 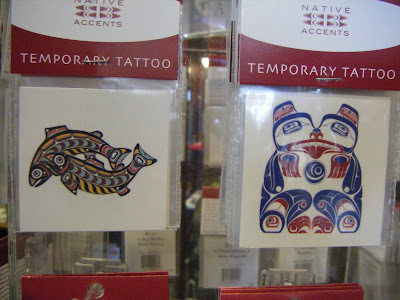 Nancy, I loved your blog about the Pike Place Market, one of my favorite places on planet earth. You and Nate hit the high spots! My brother lives in Seattle and we visited for the first time two years ago and we went to Pike’s market and spent a few wonderful days getting lost amid all the chaos and stores and food and fun! We saw the fish being tossed (my son got a t-shirt and a head full of crushed ice from following behind one of the workers too closely) and we had a lovely time! We ended up downstairs and went across the street to the aquarium and fell in love with the otters! You are so lucky to have this treasure in your hometown! Oh! We also sampled delicious cherries and doughnut peaches– yum! The nice gentleman who cuts my hair is right by PPM, so for lunch on hair-cutting days, I either go to Piroshky Piroshky for their potato, cheese and mushroom pirojuk (sp?) or to Mee Sum for their jai, or monk’s food (rice steamed with lup cheong, (Chinese sausage), a boiled egg, peanuts, dried shrimp, and other unidentifiable yummy stuff. Nancy, I’m beyond impressed with you instilling a sense of community in Nate at such an early age. 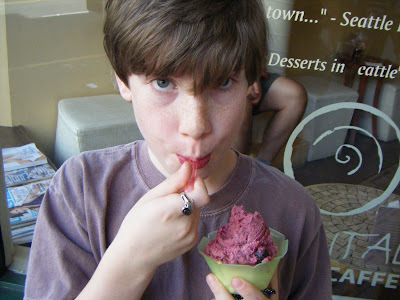 I also am impressed with your ability to get an almost-10-year-old to pose for so many photos. Great blog on the market!! One of my favorite stops is The Crumpet Shop. Their buttery current scones and tea are excellent. 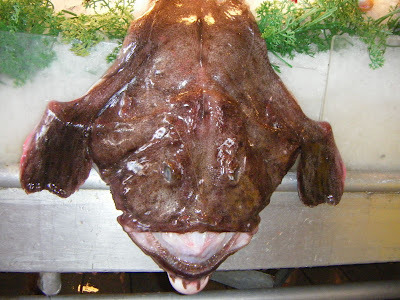 I also love the halibut fish and chips at Jack’s Fish Spot. Good job Nate. You are a natural! I remember the “trained” cats!! 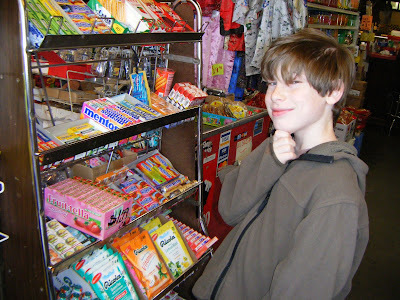 My kids are young adults now & have always loved the market! 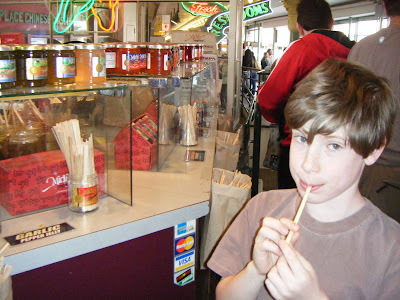 When younger, they especially enjoyed Daily Donuts, the honey sticks, the fish throwers (scary but fun, they thought! 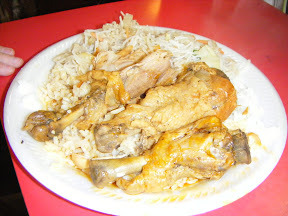 ), the free tea at Market Spice, the crepe stand (more stools to sit on!) AND they actually liked DeLaurentis’ – esp. choosing fun pasta shapes to take home & try! My 5 year old and I love to spend a day at the market. We enjoy lunch at Saigon, followed by coffee and a meringue at Le Panier and then a visit to Franks Produce. We also make a point to pick up some nice cheeses and fresh pasta at DeLaurentis. How could I forget the Crumpet Shop!? We even had my daughter’s birthday party there once! Nate….you are so BIG!!! I called Allie and told her to log on so she could see you tonight. She actually just called from WSU and I had the music on from Clint Eastwood…and she said…WHAT are you listening to???? We always head to the bag o’ hot doughnuts made by the tatoo guy. My dear and me like to share everything so we can eat our way through the market. A fav for breakfast is Lowells. A place made famous by Tom Hanks. The upstairs view is killer!! Bring all your out of town folks. Also always a free mac and cheese sample fron Beechers…yum. For an authentic mexican lunch we eat at The Crying Pig…funky retro blue tables, pinatas and cheap good food!!! We always stop by the German Meat market for take home sausage. Don’t forget the cool bookstore…Mister E’s. 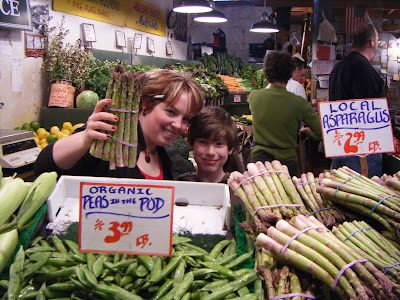 I grew up going to the Pike Place Market every weekend, over to Sosio’s for produce, Le Panier for croissants and chocolate éclairs, DeLaurenti for Italian goodies. We’d have brunch at Maxmilien’s or Café Campagne or Etta’s and walk through Sur La Table and then go buy flowers before heading back to the car. Twenty years ago I bought whoopee cushions and invisible ink at the magic/novelty shop and a smoothly polished piece of pink quartz wrapped in silver wire and strung on a black silk cord in another shop. (And now I’m not quite old enough to have a nine-year-old of my own, but old enough to not get the Zack and Cody reference, although I do know it’s a show on the Disney channel). Kairu, I’m still grinning at your entry — I didn’t get the Zack & Cody reference either. And dang, I’m going to have to check out the chocolate eclairs next time I’m there! For a big laugh (courtesy of Seattle’s own Dan Savage), you’ll have a better understanding of the “Zach and Cody” reference if you listen to this episode of “This American Life” http://www.thisamericanlife.org/Radio_Episode.aspx?episode=328&date=05022008 — a classic, featuring Savage offering his own inimitable (and dare I say) right-on take on the series. One that will explain Nate’s smirk in the photo with his gal-pal A.J. (and no, I didn’t put him up to that pose, he did it on his own). And Kairu? Re: the email. I got your reply, I just haven’t had time to respond graciously (my email-box looks like my desk, only 10 times worse, and my desk? well. . .). You — and your writing, about food and restaurants — rock my culinary/literarily-minded world. Nancy – thanks for that link! It makes so much more sense now…and it was hilarious. I’m never going to see the Disney channel the same way again. 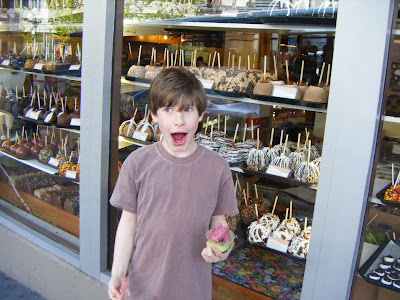 Tomorrow I’m going to try and head to the Pike Place Market and hit all the places that make up my childhood. And please don’t worry about the email – I couldn’t find it in my sent file and was convinced that I had erased it instead of sending it – if you think your inbox and desk are bad, imagine something ten times worse, and that would be my desk. Loved this story. It highlighted places I NEED to visit. Thanks! Hi Nancy. I just wanted to send you a quick e-mail and tell you how much I enjoy your blog! I read it every day. I also wanted to tell you what we (hubby and our two toddlers) did this weekend because of reading your blog. 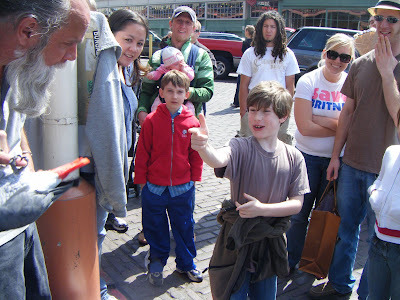 (I recently went back and read your entries from March) We packed the kiddos in the car on Saturday morning and headed to the Pike Place Market. A quick stroll around the place first and then we had breakfast at the Athenian. We had a perfect table upstairs with a view of the ferries. The food and service were great. Then we stopped to buy some fresh produce, stopped at one of the seafood counters and picked up some Dungeness crab, clams and mussels and topped it off with a stop at Don and Joes for various meats! Their prices are quite reasonable and the quality is obvious. 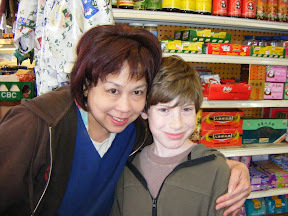 We both grew up in Seattle (me-Ballard, Jim-Wallingford) and have wonderful childhood memories of the Market. For some reason, though, we had neglected it for many years other than escorting the occasional visiting relative there. What a shame! 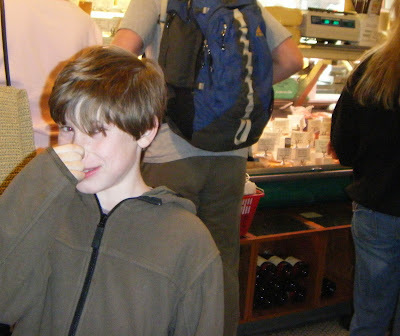 I forgot the wonderful smells of the place and all of the tempting food choices. The kids loved it and we plan on taking them there on a regular basis so when they grow up they’ll have their own great memories of the Market. So, thanks for the inspiration and for making two “natives” remember what a treasure we have in the middle of this fast-changing city! My husband and I are celebrating our third anniversary this coming weekend and I’m going to make him take me to Pike Place! Ever since moving up to WA from CA, I’ve been dying to try some great Filipino food. (It’s so hard for me to get the ingredients to make my own Filipino cuisine bec I live out in the boonies). Thank you for providing the information I needed to get my “fix”! 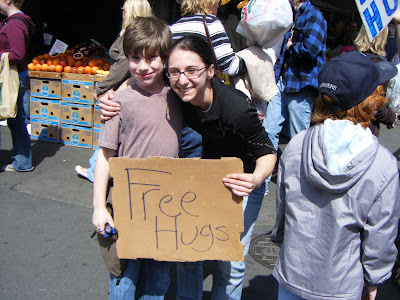 I just found this while searching for other free hugs in Seattle. I was the other hugger there that day (not pictured but you can somewhat see my sign). I’m glad to know that you took the time to get a hug! Come down any time, I’m usually there on Saturdays after noon.